The Keene Police Department is standing by an officer who dragged a 77-year-old grandmother out of her car for speeding after she repeatedly refused to provide her driver's license. The entire arrest was caught on video. 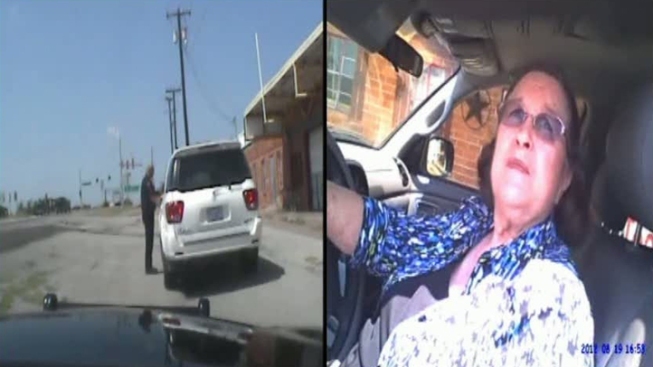 The woman, Lynn Bedford, of nearby Cleburne, Texas, was stopped on Aug. 19 for driving 66 mph in a 50-mph zone. Bedford told Sgt. Gene Geheb that she had a bladder infection and had to go to the bathroom, but the situation quickly escalated when the officer asked several times for her identification and she refused. "Just hurry up; I have to go to the bathroom," she said. "Let me see your driver's license and insurance, please," the officer asked. "No, I want to see your driver's license and insurance, please, and then I'll listen to you," the officer said. "I'll give it to you in a minute," she replied. "No, you give it to me now, or I'm going to take you to jail," he said. "Well, go ahead," she said. The officer then pulled her out of her car and handcuffed her. Bedford's attorney, Clay Graham, of Fort Worth, said the officer overreacted. "The officer is not very interested in listening to what she has to say," Graham said. "She gets a little frustrated. And then he just overwhelms her. That's what I see. And then it goes from routine stop to ridiculous stop." Graham said Bedford was injured during the arrest. He said Bedford is not interested in filing a lawsuit right now but isn't ruling it out in the future. The lawyer said the woman was returning home from playing the piano at church when the incident occurred. In a statement, Keene Police Chief Rocky Alberti stood by the officer's actions. "This incident has been reviewed thoroughly by the Keene Police Department and the City of Keene Administration," Alberti said in a written statement. "All parties have concluded that Sgt. Geheb did not violate any state laws or department policies, and in fact was following department policy in regards to violators not providing identification."